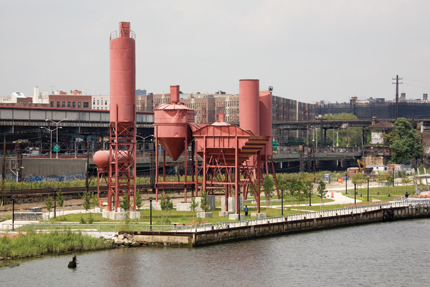 With railroad tracks, an elevated subway line, and the Sheridan Expressway on one side and the muddy and fragrant Bronx River on the other, the site of Concrete Plant Park is far from picturesque. But with its now unused silos and mixing bins retained as a folly—reminders of the site’s former use—the park has the uncanny effect of transforming this post-industrial landscape into a place of serenity and rugged beauty. Designed by the Bronx landscape architecture team of the Department of Parks and Recreation, the park is not conventionally pretty. “It’s an intertwining of the man-made and the natural with an on-site urban ruin,” said James Mituzas, a landscape architect with the Bronx Parks team. Plantings are spare, the design moves are simple—a few curving paths, a hard-edged esplanade, a soft-edged portion with a kayak launch, a shade structure, some benches and tables—but the results are surprisingly moving. The no-frills materials look appropriate here. 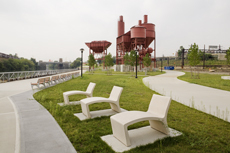 And like Socrates Sculpture Park in Queens, Concrete Plant Park benefits from its location off the beaten path. One arrives with a sense of intention and—though the park will likely be well used when it opens next spring, due to the scarcity of parkland in the neighborhood—it feels like a discovery. Walking south through the linear park, one passes the long-abandoned Cass Gilbert-designed Westchester Avenue Railroad Station, which hangs high above the tracks and the park to the east. Plants sprout from the terra-cotta roof and brightly colored tiles still hang from the walls of the building, which appears to hang perilously over the site. Looking east toward the river, the other side of which is lined with crumbling cinderblock buildings and rusted corrugated fences, it is clear how the city has turned its back on the waterway. That attitude is changing, slowly. Concrete Plant Park is a small link in what will eventually become the Bronx River Greenway, which will extend up to Westchester County. Within the park, the silos hold your eye. Painted a matte kidney-bean pink, the silenced concrete works look like sculpture as much as infrastructure. Even the somewhat clunky concrete bases, which were recast by Parks, add to the composition’s abstract quality. They also provide shade while the new trees mature.